A frantic late-night, last-minute bidding frenzy saw the the latest addition to my ‘wish-it-was-the-40s’ vintage knitting fest arriving on my doormat yesterday. 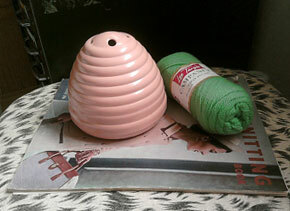 It’s pink, it’s bakelite, it goes rather nicely with my vintage Lee Target Campanula wool. I love it in a way that’s bordering on pointlessness (apart from the fact that it has a purpose and is actually extremely practical). The bottom screws off to put the wool in, and there’s a handy needle gauge incorporated. I’m thinking of petitioning Patons to re-make them in a range of colours, but then plastic just wouldn’t cut it in the way that bakelite does. Feels so solid and smooth and satisfying. They were manufactured between 1930-1960, although I’m not geek enough to know if there are any ways of checking the dates through any design quirks (anyone out there got any more details?). They come in green, red, orange, cream and blue too … I feel a senseless collection coming on.